Your pizzas will easily glide hot and ready right out of the oven with this 16" x 18" American Metalcraft 4016 pizza peel. With triple-riveted ferrules and made from 14 gauge aluminum, this product is sturdy and durable. The wooden handle offers a grip which is sleek, smooth, and comfortable. The wide blade will allow you to transport your pizza pies confidently and efficiently. Also, the 19" pole will keep your hands safely away from the heat, eliminating and worries about being burned. Perfect Pizza Peel. The quality is excellent and it does not loose its shape from use. Takes a hard beating in our very pizza pizzeria. This is a Nice pizza peel. Good handle on the end. Very sturdy and easy to use getting pizza out of oven into box or to serve. Finally a great sturdy peel!! we use this everyday at our restaurant. Built very sturdy from quality material. The past ones always seem to break. This one is great for turning pizzas on a screen and slides under easily as well. Cleans easy too! Perfect for the 12 and 16 inch pizzas that we do. Long handle but not too long that its in the way. Very durable as well! This is a good, sturdy pizza peel. Does an excellent job getting our XL pizzas out of the oven. Sturdy handle and rugged metal peel. Great peel for getting pizza and bread in and out of the oven. My one modification was drilling a small hole through the end of the handle and tying a string to hang it on the wall when not in use. Excellent product, Very good Quality, I totally recommend it, I use it for making pizza is very manageable and very easy to hold not heavy like other Pizza Peel will last forever. the Price is very Good. Extra long handle and wide aluminum peel are great for any pizzeria daily operation. Cleans out great nothing will stick, this is a purchase for a lifetime of use. This product was just what I needed and it came as it was described when I ordered. The shipping and delivery were quick and reasonable. I would definitely order this product again. great pizza peel, we use this item daily and it seems to be holding up well to the wear and tear of teen aged employees. We are super hard on pizza peels, so I have ordered a couple of these. They usually last us about a year, but the price is really great and it's the way we use them that breaks them down so fast, so I will continue to buy these. I really like that this one has a pretty big aluminum part and the handle is nice and long. Excellent value. Metal portion is thick enough to support a heavy pizza the size of the peel but thin enough to slip easily under the crust. Handle is unfinished and could have used slightly more sanding but is a solid and blemish free wood. I sanded it with 220 grit and put on a tung oil finish. The front and side edges of the metal portion were well smoothed and burr free but the back edge closest to the handle could have used a little more work. Just rough enough that if felt uncomfortable to slide a finger along. Had a protective plastic coating on one side which didn't come off the logo portion very easily. For the price I was completely fine with the minor flaws. Great pizza peel. We like the quality vs. price. It's really durable but flexible in same time so its easy to work with. Highly recommended. Good for the price I go through around one of these a year from wear and abuse. We cook around 2500 pizzas a month so it really gets used. The only then that could use improvement on is steel rivets versus the aluminum ones used. They wear our sliding across the oven deck, but still a very good product. This American Metalcraft aluminum Pizza Peel serves its purpose well. It is a Great price for the product. Doesn't last forever, but a good value! The key is: it does the job and does it well. Just as important, its cost is low and thus it is an obvious choice for when a metal product is needed. Can't be this product from Webstaurantstore. Some people prefer the wood pizza peel but I find this one better as long as it's used correctly. it being so thin gives you a lot more control over getting your pizza from the prep table to the brick oven stove. Just make sure you keep it dry and do a quick wipe after each use and it'll give you no issues. Great product. Great price. This is another perfect pizza peel with longer handle for deeper and safety concern to use when business is busy and you have few pie in oven makes easier to take pie out from back of oven. The American Metalcraft aluminum pizza peel is a great pizza peel. Nice size to the peel head and strong, not flimsy at all. Very nicely priced as well. We use this at our restaurant and it works great. It is easy to use. It peels the pizza off the pizza screen very easily. My wife ordered the little brother for this one for me for Christmas in 2012. It worked great for the 12" pizza screens she bought me, but was too small for the 15" ones, so I bought this one. It works great. I spray the heck out of the pizza screens she bought here with cooking spray before placing the dough on them, then use the Pizza Peel to slide the Pizza off with no issues and a beautifully browned crust. You can pull the pizza out and cut it on the peel, then neatly slide it right back onto the screen for serving. This pizza peel works great! The pizza never sticks, and the peel is very durable as well as lightweight. It's the perfect size for 16" pizzas or anything smaller. This pizza peel is very durable and sturdy. We had our last one for a few years before the rivets started coming loose. Works great for our 18" pizza. I absolutely love this pizza peel! It slides easily under my pizza pans. The wood peels are too thick when using pans or screens. This works great for me! This pizza peel is just the right length to get our 12 and 16oz pizzas out of our oven. The whole peel is made well and holds up good with the weight of the pizzas and stores out of the way with the optional hanger we bought seperately. We use these pizza peels everyday and they are pretty nice. We have had ours for over a year and they still work fine with little wear to them. They are good quality and built to last. A great peel for the money. We needed a sturdy and durable peel for our larger pizza. This peel is great for not only preparing our pizzas, but sliding them in/out of our oven. This item is fantastic for big pies! XL 18" Pizza's are very popular in FL.. and I love it because it gives you more cheese area and creates a wonderful "bread stick" like crust! It reaches far back into the oven and handles heavy or near heavy pizza's like 14-18 to Sicilian pizza! I love this peel!! 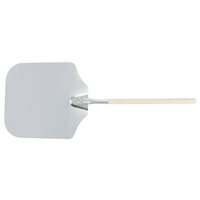 The American Metalcraft 4016 16" x 18" Aluminum Pizza Peel with 19" wood handle. It is perfect for turning our pizza's or removing them from our stone brick pizza oven. This is a well made peel that is light and easy to use. The price was the best I could find on the web. The customer service is outstanding and fast shipping. Awesome. This pizza peel is strong and durable, and wide enough for the biggest pizzas that we've ever seen! And the wood handle is nice and long to avoid burns.